For manufacturer fire ratings please click here. Current building regulations state that only fire rated cladding can be used on buildings over 18 metres high, when used in conjunction with fire cavity barriers, to delay and reduce the spread of flame within the cavity created. Most external façade cladding panels carry a minimum classification of ‘surface spread of flame’, Class 0. However, only fire rated cladding panels offer the preferable classifications of limited combustibility or non-combustible. In accordance with the European Standards EN 13501-1 cladding panels hold fire classification results ranging from A1 to D.
An alternative fire classification sometimes quoted on cladding products is the BRE (British Research Establishment) BR 135 standard. Unlike the European Standards this test does not offer specific grading with letters, it instead tests a cladding systems resistance to fire during a specific time frame. In order to meet building regulations, for tests using this method, the cladding product must be supported by a classification report, confirming the specification criteria the BR 135 has met. We recommend that you check prior to specification that the cladding product you require holds the appropriate fire rating required by building regulations for your specific build. All major cladding providers will carry out any appropriate fire tests for their products, and if requested will supply this information. Additionally to the fire tests carried out at the BRE approved centres, some manufacturers often apply for further BBA (British Board of Agrement) or CWCT (Centre for Windows and Cladding Technology) certification. On the occasions where a product is approved by one of these bodies this means the fire tests have been assessed, and included as part of their certificate within the report. Always be sure to request a copy of the manufacturers’ classification reports and Declaration of Performance for confirmation of compliance. Please refer to the specific manufacturer data sheets for the relevant fire classifications of the cladding product you require; i.e. high pressure laminate (HPL), Wood Veneers, Fibre Cement, Specialist Composite panels. For further information on each manufacturer please visit their individual pages. 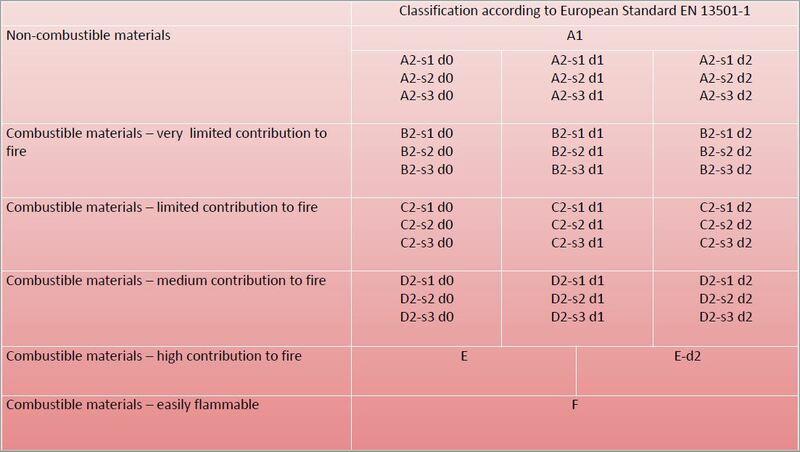 Further to the current British Standards (BS) regarding cladding testing, below is a comparison of the ‘old’ BS classification compared to the more recent European classifications. Part 6 – Fire propagation, measuring the contribution made by the component assembly to the growth of the fire. The European standards are broken down into codes. ‘D’ relates to ‘flaming droplets and particles’ within the first 10 minutes of exposure.